Some find it hard to accept that God would love some people more than others. That wouldn’t be fair, they say. But God became man. If he did not love some more than others, Jesus wouldn’t be fully human. For human beings have family and friends. While we can do good and even risk our lives for a stranger, we have special bonds of intimacy and affection with a rather small circle. Out of twelve, Jesus had one especially beloved. In the Gospel of this beloved disciple, we learn that Jesus had one family who was particularly beloved. The family was that of Mary, Martha, and their brother Lazarus. So it was a surprise to all that Jesus did not come immediately when he heard that Lazarus was ill. Of course he was a busy man. But Jesus had dropped everything many times before to heal strangers. This, on the other hand, was one of his dearest friends. Not to worry, he explained to his disciples. This sickness would not end in death. 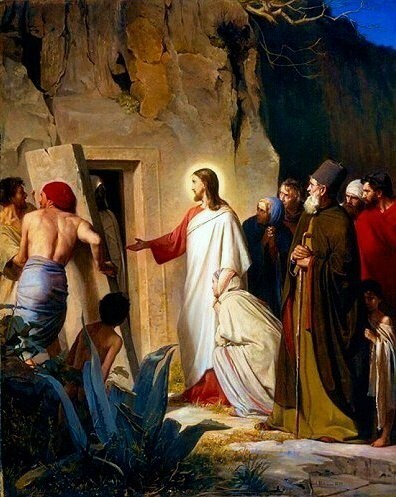 So imagine their surprise when he tells them a few days later that Lazarus was dead and that they were going to visit the grave. Jesus knew what he was going to do. Yet when he encountered a distraught Mary and her weeping companions, he did not rebuke them for crying. He did not say they should wear white and rejoice that their brother had finally gone home to heaven. No, he wept with them. Some people accept death as a natural part of human life. Others think death to be merely a portal to eternity. Jesus saw death as an enemy. His Father had never intended for us to experience it. In fact, he forbade Adam and Eve only one thing – a fruit that would make them subject to it. It was through the envy of the devil that death came into the world, not the plan of God. Death wrenches soul from body. It rips loved ones from the embrace of their families. So in the presence of those wounded by death’s sting, Jesus weeps. Jesus’ miracles in the gospels always spring from his compassion. But he always has more in mind than simply helping the victim lying before him. His miraculous works in John’s gospel are called signs because they point beyond themselves to something greater he will do to gain a still greater benefit for all. This is why Jesus allowed Lazarus to die in the first place. Because in calling Lazarus forth from the tomb, Jesus was making clear why he had come. His teaching was of course sublime. And his cures were life-changing. But wiser and healthier people still faced the horror of death. If Jesus were really the savior, he had to save us from the grave. And the salvation would have to be a permanent one. Lazarus’ resuscitation was only a stay of execution. A few years later, the mourners would have to assemble around his bedside once again. So in the presence of the great crowd who had assembled for the funeral, Jesus called Lazarus out of the tomb. This demonstration of Jesus’ power over death was a sign of his own coming resurrection — and of Lazarus’s and ours as well. This is the last recorded miracle or “sign” in John’s gospel. Jesus knew it would be. You and I might expect that the news of this miracle, brought back to Jerusalem by numerous eye-witnesses, would lead to the acceptance of Jesus as Lord and Messiah. But the Lord knew it would have the exact opposite effect. It demonstrated to his enemies just how great a threat he was. They had to act fast to stop things from getting out of hand. However, that was all part of his plan. For Jesus was in total control. He was determined to lay his life down willingly, to experience the horrible torture of crucifixion, the bitter wrenching of body from soul and friend from friend. He was willing to do this because, by means of it, he knew he would accomplish more for us than he had for Lazarus–a victory over death that would last forever.